The University has applied for outline planning permission for a new science/engineering led Campus. The Council has agreed to demolish the former Post Office Parcels Sorting Office to enable the University to build on the former Cattle Market site two buildings of 8 and 9 floors to give approximately 43,400 sqm and 7,900 sqm of University space and two student residential buildings of 10 and 12 floors. Three student residential building of 11, 18 and 25 floors are proposed on Arena Island. The site would accommodate up to 1,500 student rooms and provide ground floor commercial space of approximately 7,050 sqm. The Society assumes that some of this space would be made available for medical services and children’s nurseries. This will be a mainly graduate community, with a population larger than that of many towns. The Society supports the planning application, we are encouraged that the planning boundary includes the Totterdown Basin and Cattle Market Road. A partnership with the neighbouring landowners, the Council and Network Rail is critical to the scheme’s success. The Society is disappointed that the Council will demolish the former Cattle Market Tavern, which could create an individual statement on a human scale, a blend of the old and new in the spirit recommended in the Enterprise Zone Spatial Framework. The Society is neutral about the proposal to construct tall buildings; the east side of the river may be an appropriate site. The Council and University have agreed suitable viewpoints to assess the impact of the tall buildings. The Society was heartened by the University’s commitment to deliver high quality architecture. The tallest building gives an opportunity to create an internationally recognised symbol of the University and the City’s aspirations; an image that and University and the City would be proud to reproduce in their publicity. A design to match the Wills Tower would be impressive. The group of new buildings could create an impressive entry to the city from the railway. The prominence in the Enterprise Zone and the importance of this development requires exemplary architecture. The masterplan contains ambitious proposals create high quality public space and recreation areas on both the Cattle Market and the Island sites. Circulation to the east would be compromised if the new foot/cycling bridge over the River Avon to Avon Street and the reinstatement of the Totterdown Lock footpath are not included in the first stage of construction. 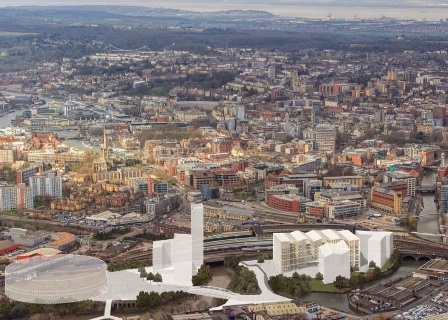 An earlier proposal included a pedestrian bridge to link the Arena to the proposed new entrance to Temple Meads Station in Cattle Market Road. The Society has asked the Council and the University to consider the link at this stage in the planning process. The Society is pleased that the new Campus will include some residential accommodation. The Campus will accommodate around 5,000 new students. The Society has not seen a projection of the number of new academic and non-academic staff. In recent years the University has expanded and left the market to provide accommodation for its increasing population. Despite the growth of privately managed student halls of residence this laissez faire policy has damaged the local housing market. The additional academic staff will look for homes in a city that continues to suffer serious house price inflation. The Society has suggested that the University should provide a housing impact assessment in relation to both the incoming student and staff accommodation demand. There is public concern about the substantial peak time traffic that the Campus could generate. The local road network is at capacity during peak hours. The practical effect of the University’s car-free development will transfer parking to local roads. The failing of this site is that there is no concentration of bus services. The proposed bus service to the Cattle Market drop-off point would only serve other University sites. The inadequate public bus service is a weakness of the whole Enterprise Zone. The Society assumes that the University and the Council will have discussed the improvement of services with local bus companies. The Society has continuously raised this important public issue. You are right about the infrastructure load on the locality– it could end up like what’s happening due to access from the M5 to an expanding Portishead- logjam! The recent coverage in the local press of this scheme showed a megawall of buildings of common height; this must be broken down into variable heights, volumes and finishes. On the general theme of student accommodation, though, just how much more can Bristol cope with? Almost every conversion or new build in the central mass of Bristol seems to be for student living; or is this just a bad dream about a ghetto?